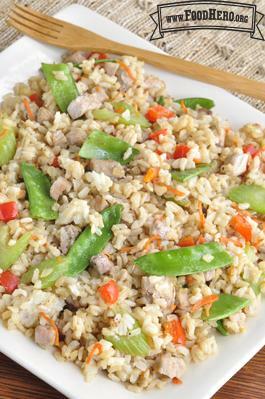 • Leftover, cold rice makes a better texture than freshly cooked warm rice. • Substitute 1 cup cooked or canned pork. Add with the vegetables. • Mix ½ teaspoon sesame oil or some ginger powder with the soy sauce. • Add sliced green onions or bite-sized pineapple (fresh, frozen, or canned). 1. Mix soy sauce, garlic powder and pepper together in a small dish. Set aside. 2. In a large skillet over medium-high heat, sauté pork in oil until just lightly browned. If using ground pork, break into crumbles as it cooks. 3. Add carrots, onion, and chosen vegetables. Sauté until tender, stirring frequently. 4. Stir in rice and seasoning mixture, breaking up any clumps of rice. Continue to heat and stir until heated through.